The top line and bottom line growth of subsidiary companies in the quarter ended March 31 this year are higher than their parent companies, indicating the fact that corporate India is acquiring better companies to improve consolidated balance sheet. An analysis of 450 companies for which the fourth quarterly results are available shows that net sales of subsidiaries increased 24% to Rs 1.64 lakh crore and the subsidiaries' net profit rose 45.6% to Rs 15,199 crore during the quarter ended March this year as compared with Rs 10,442 crore during the same quarter last year. On the other hand, standalone sales of the 450 companies increased by 15.2% to Rs 1.83 lakh crore during the quarter ended March 31, 2010, and operating profit grew by 8.6% to Rs 41,994 crore during the same quarter. The study shows that operating profit of the 450 subsidiaries increased 68.8% to Rs 35,206 crore during the quarter ended March 31. Interestingly, the sharp increase in the operating profit took place despite the fact that the interest cost went up by 74.5% to Rs 5,084 crore in the quarter ended March 31 as compared with Rs 2,913 crore during the same quarter in 2010. The top five companies according to subsidiaries sales in the quarter ended March this year were Tata Steel, Tata Motors, Adani Enterprises, Bharti Airtel and Suzlon Energy. The highest growth in sales was registered by Bharti Airtels seven subsidiaries. Some of the other companies that saw a robust growth in sales are Bharti Comtel, Bharti Aquanet, Bharti Hexacom, Bharti Telemedia, Bharti Airtel USA, Bharti Airtel UK and Bharti Airtel Hong Kong. Similarly, the top five companies in terms of subsidiaries' net profit were Cairn India, Tata Steel, Sterlite Industries, Tata Motors and Adani Enterprises. 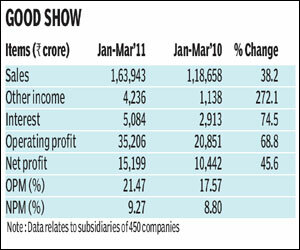 The highest growth in subsidiaries net profit was reported by Tata Steel.